F-35 is billed as a catalyst for the fifth-generation revolution, changing the face and capability of the Air Force and wider ADF. For Air Commodore Mike Kitcher, Australia’s super jet heralds the beginning of a new era for air combat. With the arrival of Australia's first two F-35s a little under a week away, the sun is setting on Australia's legacy fleet of legacy F/A-18 Hornets, with the F-35 marking the beginning of Australia's technological and capability transformation to a fifth generation air force. For the Air Force, the F-35's combination of full-spectrum low observability, from stealth coatings and materials, advanced radar dispersing shaping, network centric sensor and communications suites, combined with a lethal strike capability means the aircraft is the ultimate force multiplying, air combat platform with a projected life of 30 years. Commander, Air Combat Group Air Commodore Mike Kitcher describes the F-35 as providing a "quantum leap" in capability for the Air Force requiring both the RAAF and the broader ADF to rewrite the operational, tactical and strategic doctrines which have held true for the better part of the last seventy-five years. "F-35 presents a quantum leap, not only in terms of operational realities, but also technologically. 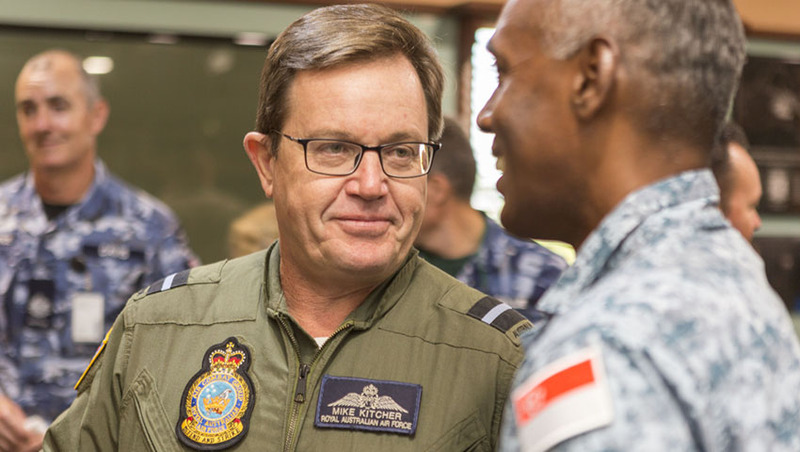 For Air Force in particular, but again also for the wider ADF, F-35 is a catalyst for developing a truly fifth generation force," Air Commodore Kitcher said. While Australian pilots and instructors have been training on the aircraft in the United States, and Australia's industry partners have been extensively involved in the manufacturing process, Australia's road to integrating the F-35 into the broader Air Force, really is only just beginning. "While we've had people in the US for the past 4 years, it started with two pilots which has now grown to about ten pilots and instructors, working closely with our partners in the US Air Force's 61st Fighter Sqn based at Luke Air Force Base in Arizona, the same support and operational infrastructure, both personnel and physical maintenance and sustainment infrastructure is starting to work up," Air Commodore Kitcher said. The platform has been designed to be as user friendly as possible, enabling Australian pilots, instructors, air crew and maintainers, an easy transition from legacy aircraft like the F/A-18 Hornets which is necessary for supporting what will become an increasing number of the fifth generation platforms over the coming few years. Air Force expects that Initial Operating Capability (IOC) for the F-35 to be delivered by 2020, which will see Australia operating two F-35 squadrons, No. 3 Squadron and No. 2 Operational Conversion Unit (2OCU) both of which will be based at RAAF Base Williamtown. Air Commodore Kitcher said, "While both squadrons will be operations capable, No. 3 Squadron will be Australia's first full, F-35 squadron that is combat capable by the end of 2020. 2OCU will be focused on the technical and material training for RAAF aircrew and for the training or all technicians and support personnel for the F-35." Building on this, Kitcher said, it is expected that by end 2020, Australia will have between thirty and thirty-three F-35s in country. Despite the challenges faced by the F-35 throughout the development process and into the early manufacturing stages, Kitcher remained upbeat about the nation's transfer from legacy air frames. "The best way to define the transition from Hornet to F-35 is like the Air Force's transition from the old propeller driven Mustangs to the early jet powered aircraft in the Meteor. I am sure we will find some lessons and some challenges, people forget that is to be expected in the roll out and acceptance of any new technology, not least of all an aircraft as advanced and complex as the F-35," Kitcher explained. Air Force's transition to a fifth generation force is encapsulated in Plan Jericho and the roll out of key force multiplier platforms like MQ-4C Triton, E-7A Wedgetail upgrades, P-8 Poseidon and the E/A-18 Growlers all serve as nodes within a broader, integrated web of 'sensors' and 'shooters'. Kitcher expanded on this, saying, "Integrating the F-35 goes beyond just the pilot and aircrew training across the technology, it involves integrating the F-35 with the Air Force's other key platforms like the E-7A Wedgetails, our Super Hornets and Growlers and KC-30As, furthermore it includes integrating the aircraft into systems like the Poseidon and the Triton which is where we start to see a web of systems created." The growing system of sensors and shooters enables Air Force to integrate within the broader ADF's push to develop a 'joint force' capable of distributed lethality, which is defined by a complex system of air, sea, land and cyber systems incorporating integrated sensors, analytics and 'shooters' to respond to a threat with the most appropriate targeting information and weapons system. "Air Force is playing its part in delivering a suite of technologies in both the air and ground domains, which will establish a complex air and ground network, capable of communicating with Army platforms like the future long-range strike missile and Navy platforms like the Air Warfare Destroyers or Future Frigates to deliver an unprecedented level of capability for the ADF," Kitcher explained. The complex nature of the F-35 platform and its reliance on accurate coding and data information has presented challenges for the Air Force, as legacy platforms like the traditional Hornet haven't been as dependent upon the data, coding and analytics in the way a fifth generation platform is, "The introduction of both the Super Hornet and Growler have helped the Air Force to develop the capability to generate the networks, networking and mission data which is now critical for the successful operation of a fifth generation platform like the F-35," Air Commodore Kitcher said. As a 'quantum leap' in capability, F-35 requires a radical overhaul of the way both the Air Force and wider ADF operate in the future. The complex synthesis of full-spectrum low observability, sensor fusion, future focused, open systems architecture and diverse strike capabilities means a step-change in the way Air Force conducts operations. "The way the F-35 has been designed, is with a focus on modernising and upgrading the platform throughout its life. This is to ensure that the F-35 is future proofed, to ensure that the aircraft is relevant into the future, but broadly speaking the combination of low observability, sensor fusion, secure data links and the strike capabilities means that the F-35 marks a significant change in the way we do business," Kitcher explained. F-35's future proofed designed focuses on ensuring that the aircraft remains relevant as threats emerge, while focusing on enhancing the concept of distributed lethality and ensuring that the platform forms a key component of an integrated, interoperable future force. The F-35 and it's diverse range of capabilities will radically change the options available to Australia's strategic decision makers, enabling a tailored, adaptable and high-capability response to a variety of threats, in short the F-35 will change the way in which the Air Force and the broader 'joint force' ADF: flies, fights and wins on the battlefields of the twenty-first century.